In which we go to a mine and the bad guys get the shaft. Alejandro Murrietta aka Zorro, here to foil the bad guys’ evil plan. Played Antonio Banderas. Don Diego de la Vega aka the swashbuckler formerly known as Zorro. Still long-haired and decadent, he had planned to leave this fight to his successor in order to personally reclaim his daughter, but after she frees him from captivity (long story), he shows up to pitch in as well. Played by Anthony Hopkins. Captain Love, the sadistic soldier who’s going to fight Alejandro. Played by Matt Letscher. Don Rafael Montero, the bad guy. Played by Stuart Wilson. All armed with rapiers, as usual. The bad guys have guns, though they don’t see much use. Elena is also there but her main contribution is to screw things up, sadly. The Setup: Knowing that Team Zorro has the map to their secret mine, Love and Montero have decided to destroy the area and kill its workers, in order to prevent Santa Anna from finding out that California was sold to him using Mexican gold. Thankfully Zorro arrives to put a sword-shaped kibosh on that. After dispatching of a few henchmen, the hero is nearly shot in the back by Montero, but he’s saved when Diego and Elena make an unexpected appearance. Diego finally gets his grudge match against Rafael, and soon Zorro finds himself squaring off against Captain Love. The buildup to the latter confrontation is oddly the more dramatic, playing out like the prelude to an Old West shootout. Zorro slowly unsheathes his sword and lets the sun glint off it menacingly– an idea apparently thought up by Banderas himself, and achieved by natural lighting. 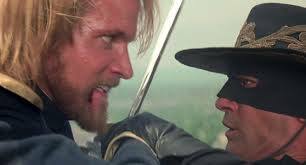 Love chooses to pull a reverse Indy-from-Raiders: he removes his sidearm with the same exaggerated care as Zorro did his sword, then tosses it aside voluntarily so the two can have a real duel. Which they do! The Fight: Much as they do with breakfast time at the Country Buffet, the old folks get moving first. After getting the drop on Rafael and punching him good in order to strip him of his rifle, Diego allows his old enemy to draw his sword so they can have a proper fight. After a bit of cross-cutting the elder Zorro has him on the ropes, and verbally relishes the pleasure he’s soon to take in killing the evil don. But gentle-hearted Elena can’t stand to watch her adopted father get run through, so she stops her real dad from doing the deed… and unfortunately Montero uses the diversion to suddenly grab ahold of her, and threaten to kill her if Diego doesn’t stand down. Unwilling to risk his rediscovered daughter’s life, Diego complies. Rafael then confirms that he was bluffing– even he wouldn’t be so awful as to kill his own daughter. But not so un-awful as to refrain from shooting a defenseless Diego, which he does. Elena pushes the gun aside just in time so that Rafael’s shot is not fatal, at least not immediately; the wounded old fox picks up his sword and the fight is back on. Unfortunately the gunshot wound severely degrades de la Vega’s fencing abilities, as gunshot wounds tend to do, and the remainder of his battle is a losing one. Eventually the good guy is disarmed, but just as Montero prepares to slice him open, Diego notices that his adversary’s foot is conveniently placed in a pile of leather straps attached to the wagon used for hauling up the gold. At the last moment, Diego ducks out of the way and hits… something so that the wagon comes loose from its moorings, sliding down the cliff and dragging Don Rafael with it. Adios, amigo. Anyway, after their too-cool little standoff, the fellows waste no time getting down to clanging blades, with Alejandro tossing a pointed barb about how Love “would like [his] remains displayed,” in reference to the villain parading Joaquin’s be-jarred ahead in front of his brother earlier in the film. Being the “fun” pairing, Z&L get more of the dynamic beats in the fight. Zorro kicks Love down a small ravine and goes chasing after him by surfing on a shovel (! ); when he goes looking for him in a boiler room, Zorro realizes that his opponent set the whole place to explode and escapes just in time. Love tries to follow up by hiding around a nearby corner to get the drop on Zorro, but the hero gets the literal drop on him by jumping from out of nowhere behind the captain, happily chirping “did you miss me?” Alejandro even one-ups his mentors signature move, at one point slicing a tell-tale “M” into his opponent’s cheek (“for Murrieta!” he explains, gratuitously). The battle finally spills out onto a suspended platform, the two fighting frantically in closer and more dangerous quarters. Zorro is at one point disarmed, but once again he doesn’t miss a beat– quickly punching his opponent in the gut, Alejandro then knocks the stunned Love’s sword out from under his hands hard enough to launch it in the air, then snatches it from above the platform’s head bar, and runs the villain through with it. A straightforward kill executed with some unexpected panache. Although his “secret” identity is known to the villains by this point, Alejandro nonetheless removes his mask immediately after the finishing move, his true face staring into his nemesis’ dying eyes. Shortly after, the wagon and shipload of gold bars comes tumbling down on the platform, which Zorro narrowly escapes. The prisoners are saved and the three protagonists are reunited, but Diego dies a few minutes later (boo! ), barely living to see his daughter returned to her identity and finding love (yay!). The whole endeavor can’t help but feel a bit anti-climactic after the amazing one-two punch of the previous two fight scenes (a one-two-three punch if you count the horse chase scene that follows Zorro’s duel with Elena, which isn’t quite a genuine fight but is still plenty fun). If anything, the Z-man’s performance in the preceding material makes it hard to believe that he’d face a genuine threat from Love alone, but the movie tries valiantly to sell the danger and the stakes. It’s also unfortunate that Elena’s main role here is reduced to a meddlesome hostage who inadvertently gets her dad killed, after the earlier duel set her up so well as an Action Girl. She does eventually find usefulness in freeing the trapped prisoners before the inevitable explosion, so there’s that. And at least this movie doesn’t abuse her as bad as the sequel does. But for the most part, the whole thing works. The staging is inventive, and as mentioned before the cross-cutting between two different fights makes the entire thing more diverse and dynamic. And while still maintaining a spirit of fun, there’s definitely an undercurrent of menace and real stakes here, unlike the more breezy tone of what’s come before. Coming Attractions: Not the hero you deserve, but the hero you NEED.